It's been a short time since my last post again. December came and passed. The kids were off on winter break for two weeks and instead of climbing the walls we're busy taking nature walks, putting on talent show in our living rooms and baking up a storm. Today, opening my email I found out that today is national shortbread day in Scotland. Growing up Catholic, Fridays were non-meat fish days and even Sunday was an unoffical "palacsinta" (crepe) at our house. And really here in Algeria people eat couscous every Friday so I guess that makes Fridays "couscous day". Having these unoffical food days has become a tradition for me well into my adulthood. Strange maybe, but true. Withouting thinking or planning almost each day out of the week has become an unoffical celebration with my kids with food right in the center of it all. On the weekend, Friday morning is "viennoiserie day" and we have something baked in the form of beignet, crossiant, petit pain or brioche. 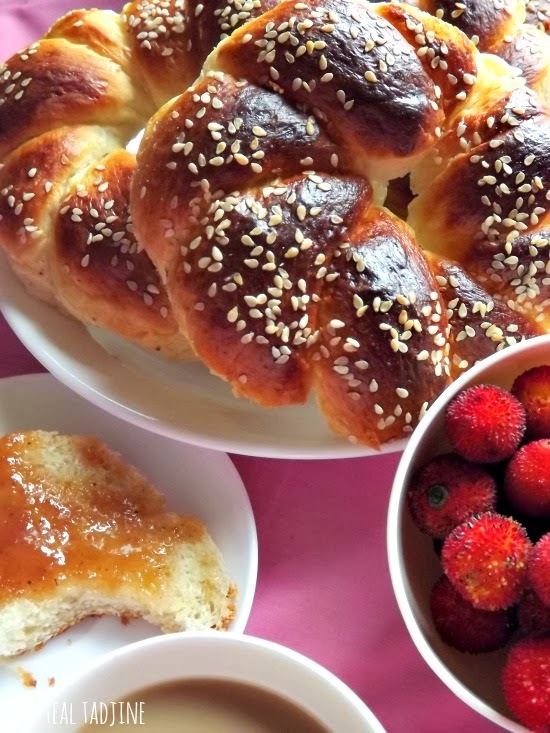 Brioche is my all favorite type of viennoiserie treats to have on Friday morning, so I thought I'd like to share this mouthwatering and heavenly brioche from Oran. It's called La Mouna, sometimes called La Mouna Oranaise or Mona. Somewhat similar to another famous Algerian rich sweet called Chrik, La Mouna is rich in history as well as taste. Chrik, if you remember has a orange blossom and anis taste, while La Mouna is primarily flavored by citrus. The recipe I'm sharing today is actually a no-knead that requries no fancy techniques or preparation. It's basically a dump and stir recipe - so easy it's virtually effortless. 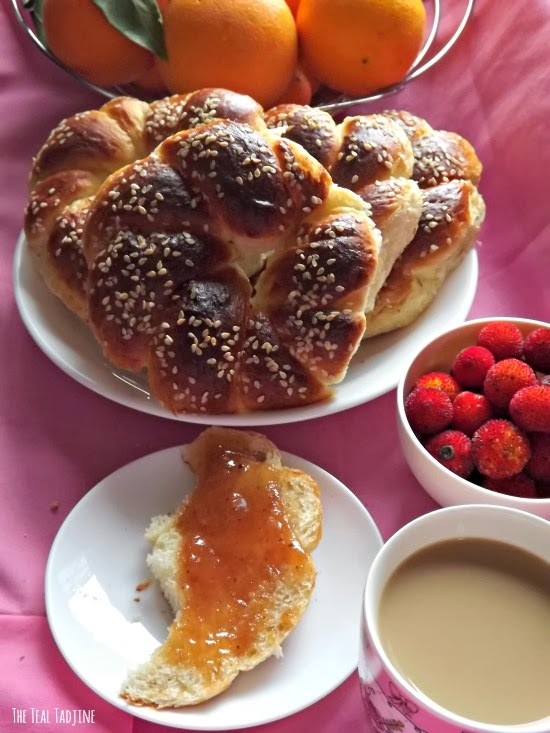 La Mouna is a dome or braided crown shaped enriched sweet bread that is the object of numerous cultural histories, legends, and culinary traditions. From the Jews, Christian to the Arabic Muslims. Each group has its own variation and even name, and its consummation and offerings has been associated with blessing and also rebirth. 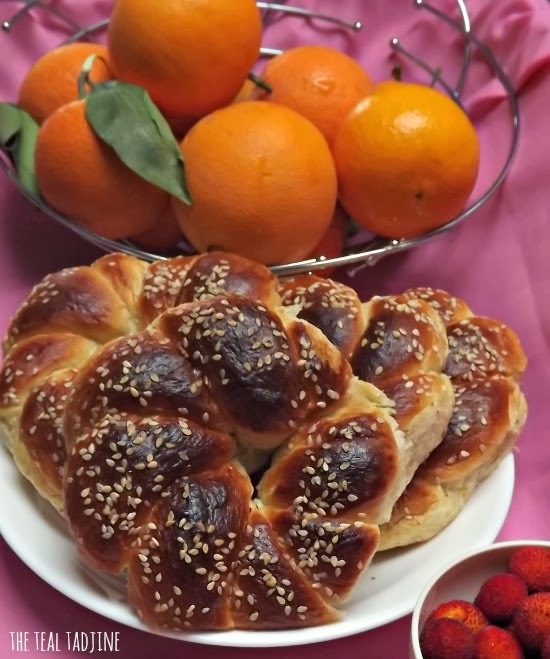 It’s for certain, a plain yet egg enriched leavened bread was prepared after the Exodus of the Jews from Egypt and when Prophet Mousa separated the Red Sea (the Pessah festival for the Jews) This bread made into way to the Holy Land, in the Levant Area where it was enjoyed for centuries by the people during the holy days. It was later adopted by the Christians, was marked with a cross on top symbolize the resurrection of the Prophet Jesus (Isa).and became a symbol for the resurrection of the Prophet Jesus (Isa) few centuries later. Another legends say La Mouna remerged around the 1100s in Catalonia, Spain, probably brought over by the Crusaders returning home. 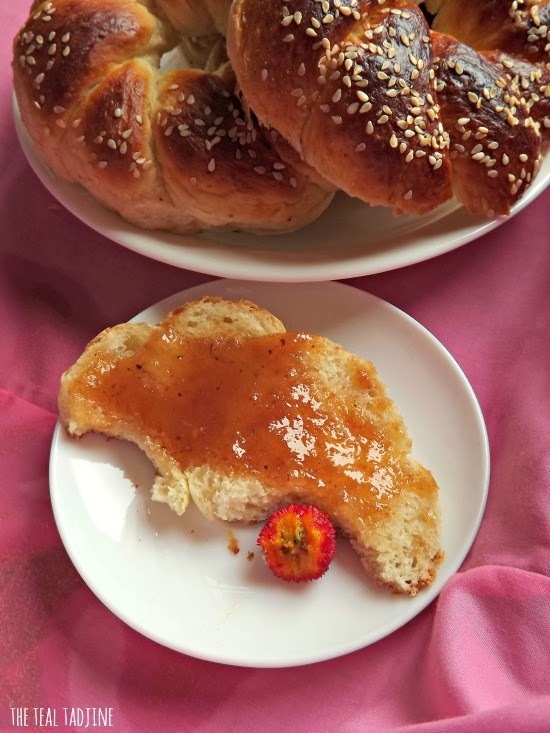 La Mouna, or probably known by other names this sweetened bread reached Europe along with spices from Middle East. La Mouna migrated to Anduasia Spain becoming one of the favored gifts the Mores would give their servants. By the etomology of the word, we know that "mouna" changed from the Spanish "mona" which originates from the arabic "mun’na" which means gift of the mouth or provisions. Later, the name was accommodated by the French by adding the "u". Assumingly through the Andalusians La Mouna found its way to the shores of Algeria during the 15th century when the Spanish king built fortresses around Oran. This bread rich in eggs, butter and fruit was grandiosely displayed on the lavish king’s tables. We could also speculate that the name of this bread came from the Fort Lamoune on the orange tree wood collected from the slopes of the fortress on which it was proofed. Or we could consider that 90% of the population of Oran was Hispanic or Spanish descendants living in Oran from the 1500s to the late 1790s. The origin of the name isn’t quite clear but as you can tell surrounded by many legends and stories. By the 19th century, one version or another was prepared all around the Mediterranean for the holiday of Easter. Each region shaping and decorating this bread slightly differently. The Spanish settlers from Valencia and Alicante brought in their wicker basket [cabassette], this pastry, then adopted by the Pied Noir communities in Algeria. In popular Spanish neighbourhood in Oran, this bread was"religiously" prepared during the holy week. The large buns were called mona, with the accent on the 'o' in the first syllable. And micos for the smallers ones. People in the provinces around Oran were accustomed on Easter Monday, to eat on the grass in the countryside. They were preparing fire roasted chicken, rabbit, and even seafood and the spring/summer favourite gazpacho with fried tomatoes, garlic and onions. At dessert time, La Mouna honored their picnic tables. The orange groves, and the woods by the sea, lend themselves perfectly to this celebration. Easter Monday soon was known to the people of the area as "el día de la mona" or the Day of Mona. The Hispanic people of Oran remained faithful in preparing La Mouna, and spreading it to other communities, especially in Algiers and Constantine until 1962 until the Pied Noir left Algeria. 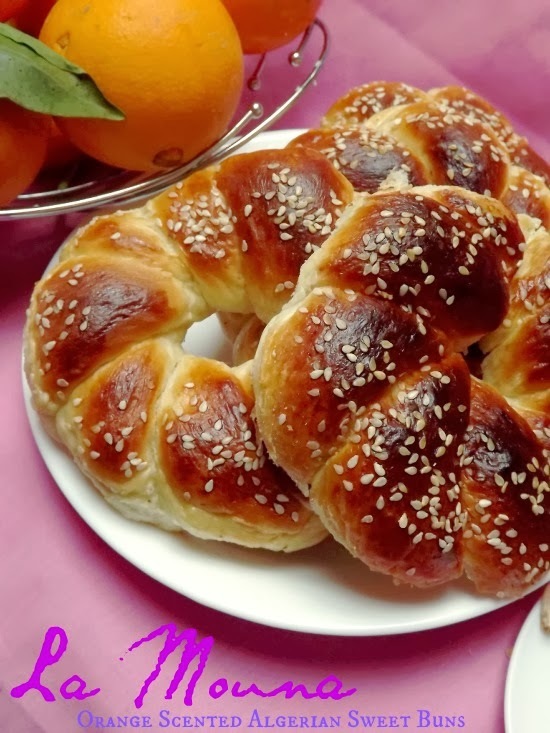 In Algeria, Jews, Christians and Muslims alike rejoy in eating La Mouna not only during religious holidays but all year round now as grandmothers would prepare this special sweet bread for their grandchildren. In the popular suburb of Sidi-Bel-Abbes and Oran, authentic recipes of La Mouna were jealously preserved from generation to generation. And as the Pied Noirs left Algeria, they took with them the legacy of La Mouna back to parts of Alsace Lorraine, Languedoc, Provence Alps, Southwest, Corsica, Paris, Italian, Neapolitan roots mainly, but also Spanish roots, regions of the Balearic Islands, Valencia, Alicante, Murcia and Almeria. In Europe, La Mouna is offered in traditional bakeries and even commeriall sold insupermarkets labelled as “Mediterranean Pastry”. But here in Algeria the tradition of grandmother preparing La Mounas for her grandchildren lives on, machallah as many traditions often do. WHISK the eggs, orange juice, milk, and sugar in a large bowl until sugar has dissolved. Whisk in the butter, sultanas (if using) and the citrus zest until smooth. SIFT in the flour and then add to it the salt and yeast. STIR with a wooden spoon until a uniform yet sticky mass form, about one minute. You should have no dry floury bits in the bowl. WRAP with plastic wrap or a clean kitchen towel and let rise overnight in the fridge, about minimum of 6 hours. TAKE the dough of the fridge in the morning, and place onto a well floured work surface. DIVIDE the dough into either 2 large balls or 12 smaller individual balls. TAKE each ball and roll into 2 logs. Continue to braid the logs then connect the ends. Place on a silicon or parchment paper lined baking sheet.Cover with clean kitchen and let rise for 30 minutes. PREPARE the egg wash by beating one egg in a small bowl. Add to it one tablespoon of milk. BRUSH each bun with the egg wash then sprinkle sesame seeds on top. BAKE in the oven 25-35minutes or until the buns are nicely golden. Remember to rotate the baking sheet halfway through the baking time for even browning. Transfer to a plate or wire rack allowing to cool before serving. Prefect for breakfast, brunch, in school lunch, on picnics or with afternoon tea spread with little homemade jam or fresh cream butter. 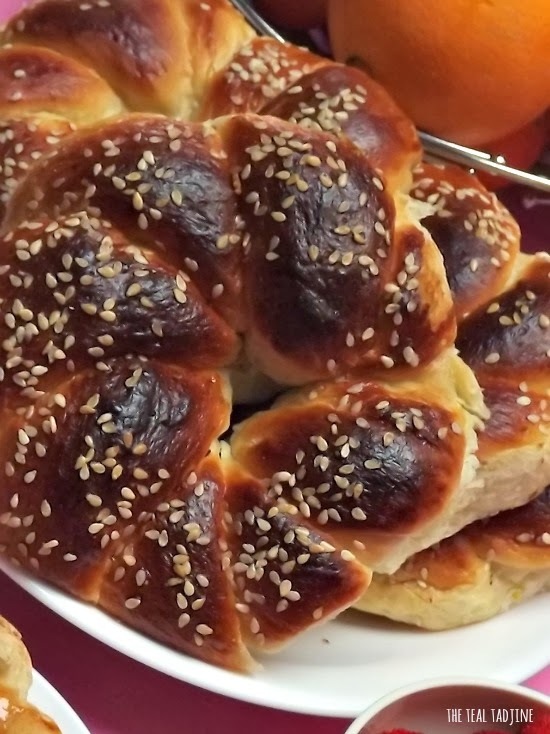 If you can't wait overnight to enjoy these delicious buns. You an alternatively, let the dough rise for 2 hours on top of a bowl of hot water (like a hot water bath). Sweet breads like this general stay fresh for only a day. If you have extra you didn't consume, place in a plastic bag then freeze for use later. To serve, thaw out on the countertop for about 1-2 hours. This, like many other breads makes wonderful French toast; its richness and tender making it ideal for soaking up flavored egg mixtures. what foods do you like that should become a national holiday? Maissou it's really a wonderful bread isn't it?! Asmaa, wow thank you for those kinds words. My oven is tricky sometimes my friend sometimes my enemy LOL. Anono, I use SAF instand yeast. You can find it in any supermarket.